Because my friends know I make cards, every once in a while a friend asks if I will make as small set of cards for them to give out for unanticipated occasions – a thanks here, a hope you’re feeling better there. No pressure! I wouldn’t want to give them loose cards so a pretty solution will fit the bill. 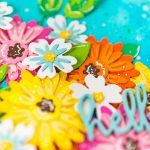 Hi there, I’m Becca Feeken with Amazing Paper Grace and today I’m going to show you how to assemble a small card ensemble in a matching basket pretty enough to sit out and be right at hand. 1. 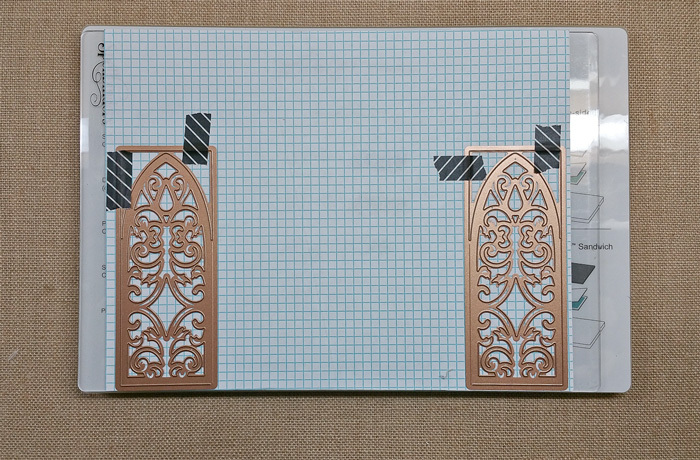 Tape the two die templates from Spellbinders S5-271 Venetian Gatefold to a thin typewriter weight paper (under 24lb). 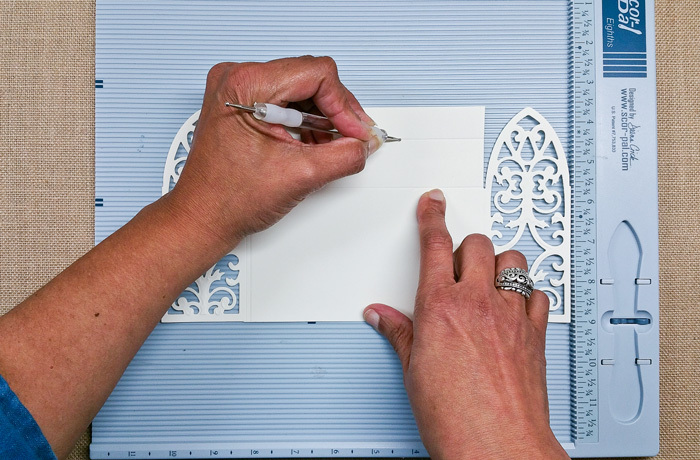 Check to be sure the templates are far enough apart to accommodate an envelope sized to your liking. Mine are space 6″ apart. 2. Cut/Emboss two identical pieces from cream cardstock – trim across the bottom to complete the cutting. 3. Score between the two valleys on the peaked pieces, then score 1-1/4″ above that – cut off any excess at that line. 4. Cut a cream strip 3/8″x 11″for handle. Using Crystal Accents cover the front of two peak motifs on one piece and glue to the wrong side of the peak motifs on the other piece forming a rectangular box. Before glue is dry slip end of handle between the two peak motifs on each side. 5. Cut a cream panel 6″wide by 3-1/8″ wide – score 1/2″from each edge, add scortape to the flaps – glue panel inside rectangular box with scortape engaging on insides of the long sides of box. 6. Tape the two die templates from Spellbinders S5-271 Venetian Gatefold to a thin typewriter weight paper (under 25 lbs). Move the templates so they are butted up against each other sided to side, but not overlapping. Cut/emboss 6 – four cream and two pink. 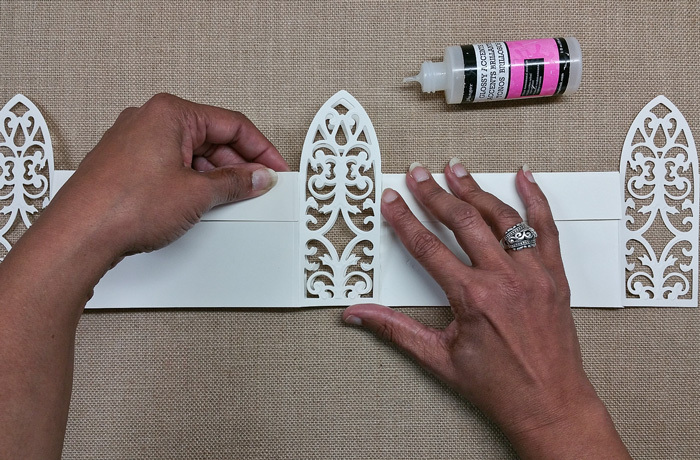 Complete the small uncut line and trim the panel to 3-1/5″ high. 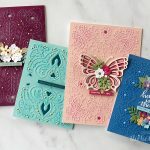 In addition cut four card bases that are 5″x 8-1/2″and score in half so that resulting card is 5″ x 4-1/4″. 7. Finish Basket by adhering pink panels to side. 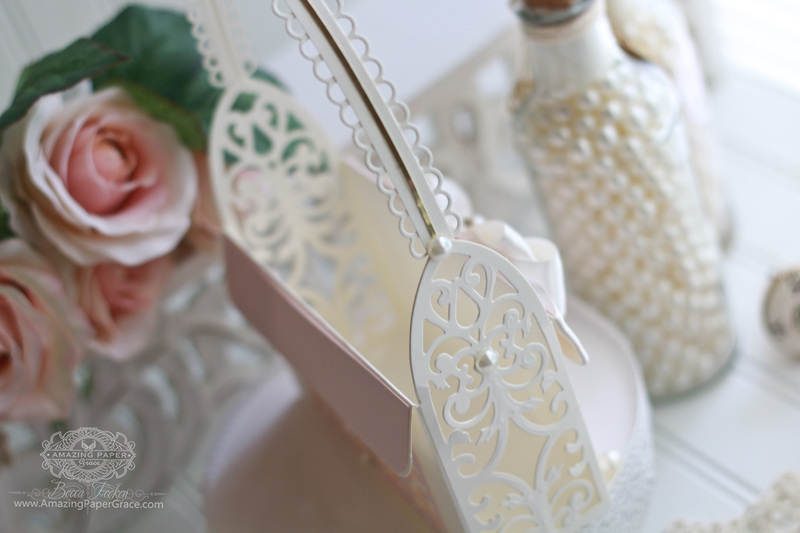 Cut four mini scallop borders and glue to handle then embellish with a 1/8″strip of gold. Mat a strip of card stock onto flaps. Attach a bow to front flap. 8. 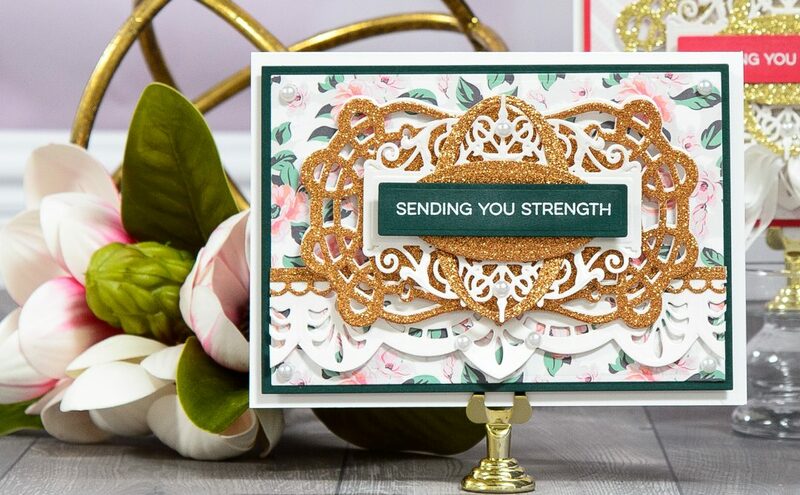 Make four cards by adhering cream die cut panels to pink card bases. 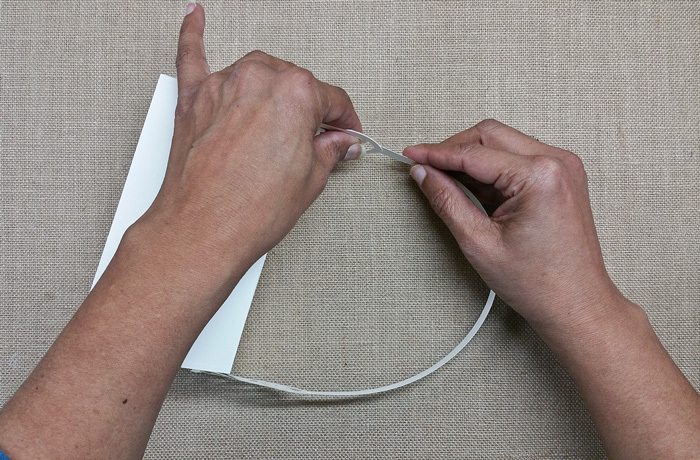 Wrap ribbon around back and attaching at front with hot glue. 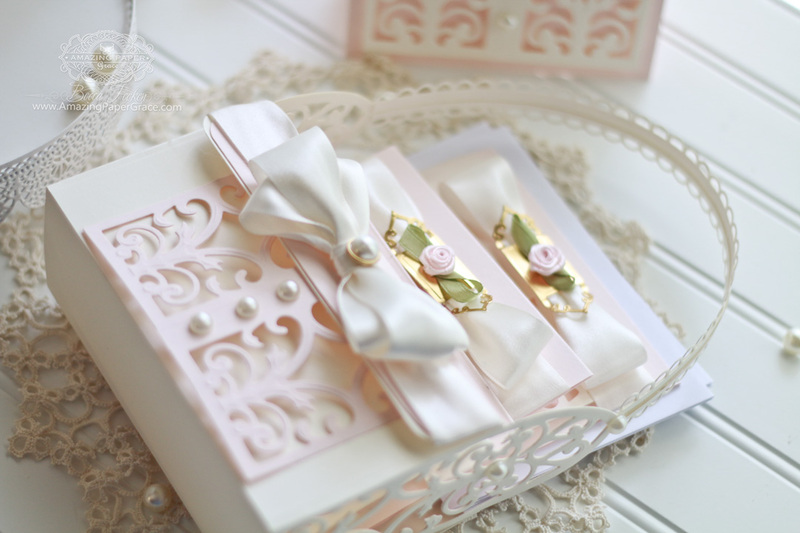 Thread two 4′” ribbon loops through the buckle motif from Spellbinders S4-732 Vintage Elegance Curled Grace Oval to make a faux bow then glue to top of card. Add ribbon rose and pearls. Place the cards in the basket and off you go to drop your gorgeous composition off with a friend. What an encourager you are! Best case scenario – they’ll be hitting you up to refill it up every month! for the job trust you lol . These would make nice gifts thanks again for all you do ! Hi Becca ! I’ve seen birthday cards that you’ve made that we’re really lacey cards. They were BEAUTIFUL!!!!!!!!!!!! I wanted one for myself, that’s how much I love that card. Anyway, I’m doing my granddaughter’s wedding. I’m making all the invitations, party favors utensil holder. I mean everything paper wise I’m making. I’m so honored that she ask me to do this for her. Now, the stopper, her colors are Navy blue, white, and charcoal gray and white glitter. I need your help about which dies would work best with these colors. I was looking at this little basket, (I thought it would be Thank you gift at her shower). But, I can’t find that die. 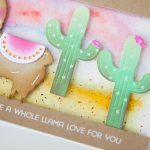 Can you suggest some f your other dies to use to make these? I love your work. The minute I saw this, I knew it was one of your creations. It just exudes beauty and grace which is what I think of when I think of you.This is a clever design and one that any would love to have or receive. Thanks for sharing.